Have you ever heard of the country of Slovenia in Europe? It is a wonderful country full of history and charm. 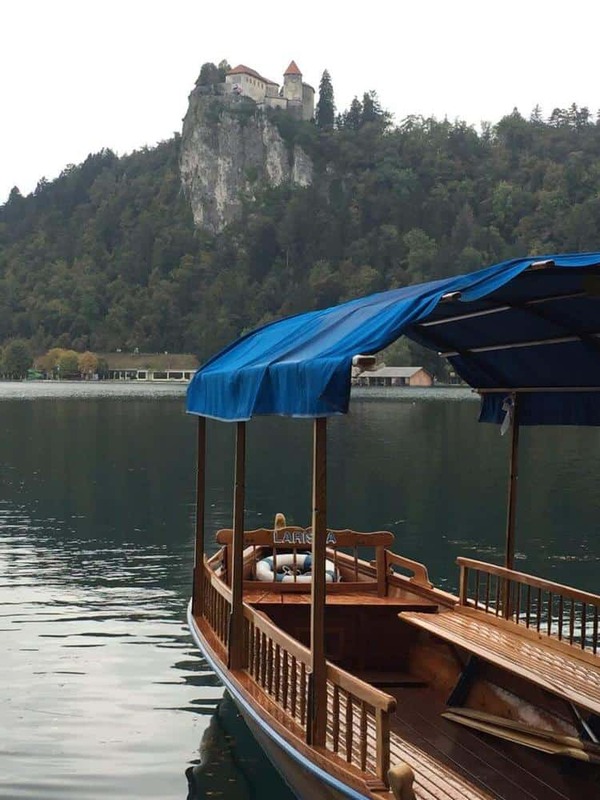 You might have seen the icon photos of Lake Bled, which is where our adventure takes place. 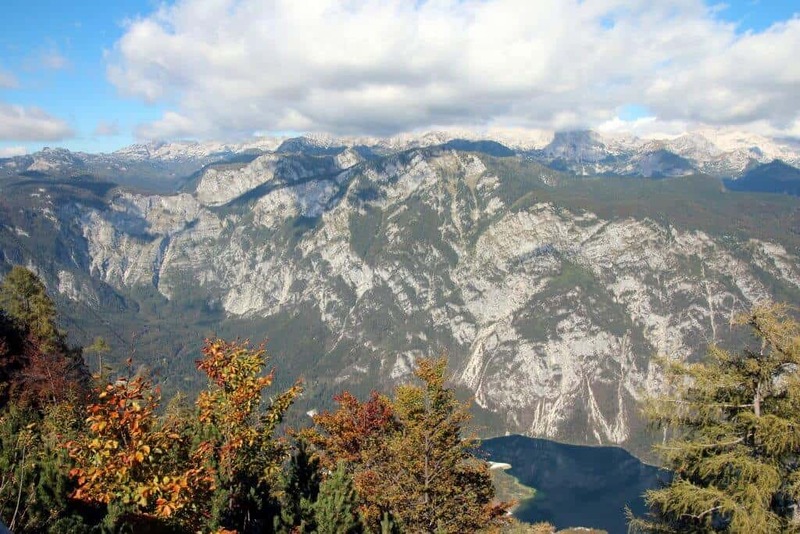 The country dates back to prehistoric times (some 250,000 years ago) and packs a punch with a castles (both Lake Bled castle and Predjama Castle), views galore from the Vogel Cable Car, Postojna Caves that you can explore for miles, Lake Bohinj surrounded by mountain peaks, and beautiful towns ready to welcome you, such as Ljubljana. 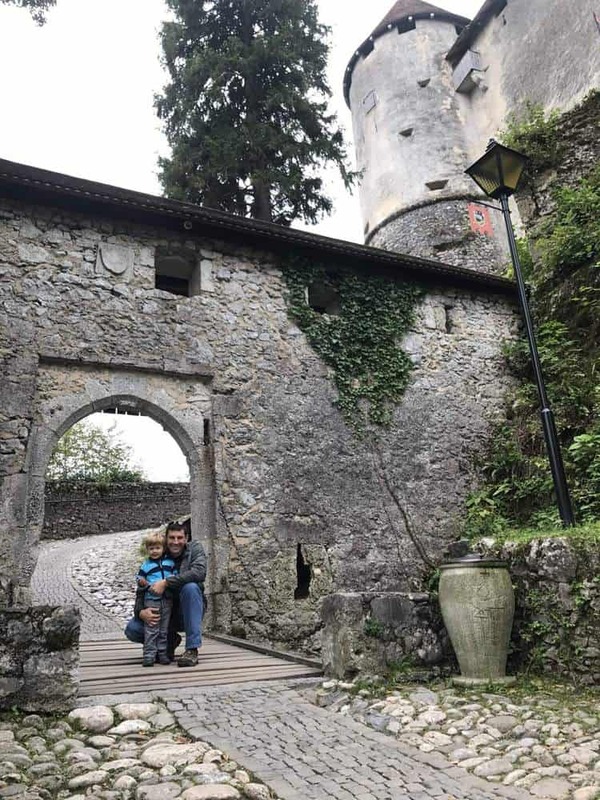 We spent a full week in the Lake Bled region with our (then) almost two-year-old son. It was one of our first trips after moving to southern Germany and it still one of my favorites for its level of uniqueness. Slovenia is also a hop and skip from its “more famous” neighbor Croatia. 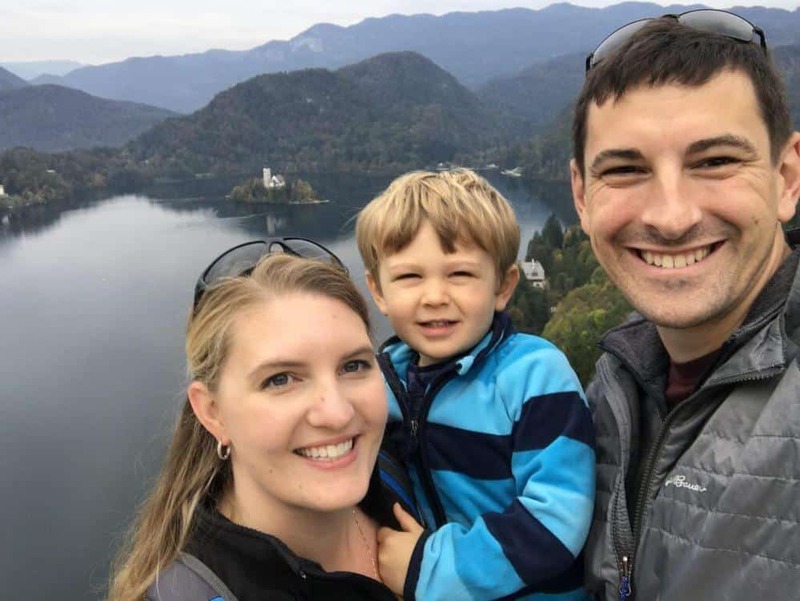 I can’t wait to share all of our favorite adventures about Slovenia and Lake Bled holidays. Here are the top 10 things to do near Lake Bled. 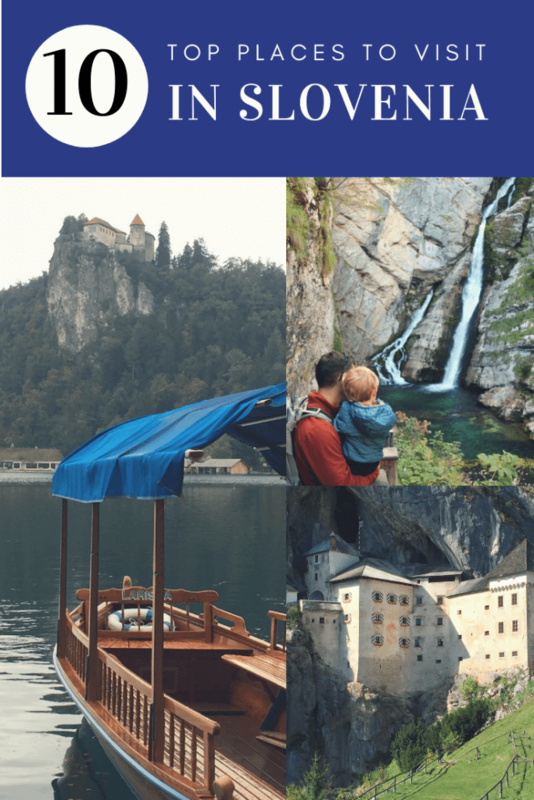 The first part of the list includes things to do directly in Lake Bled, then the remaining list starts to venture a bit further away (max 1 hour). Visiting Lake Bled was one of the highlights when we visited Slovenia. When you type “Slovenia” into a google image search or on Pinterest, the beauty of Lake Bled will be on your screen. With its blue lake complete with a castle up on the hill overlooking an island church, who wouldn’t want to explore further? There is also plenty to do in the Lake Bled area. We spent an entire week with our almost two-year-old son and I could see it being a great destination for kids of any age. Since our son was on the younger side, the little train around the lake was a great intro to the area. It typically runs from 9am-9pm and takes about 40 minutes. It will have shorter hours in the offseason and only run on the weekends, so make sure to check. At only 3 euros per person, it is a cheap way to have a bit of fun. Another favorite is taking a boat ride out to the island. You have a couple of options, you can take a Plenta boat for 12 euros per person, but you’ll only get about 30 minutes on the island before the boat is ready to return. They are open from dawn until 10 pm (summer months, shorter hours off-season), but we weren’t sure 30 minutes was enough time, so we went with option 2. If you look below the castle, you’ll see a lakeside swimming area. Head over to the dock to rent a rowboat by the hour. Yes, you’ll have to row yourself, but it’s an easy journey and you get to go at your own pace. It was really fun, even with a squirmy toddler! Once on the island, you can pay to enter the church to ring the famous bell (make a wish) and then climb the bell tour to view the antique bell and see the views. If you don’t want to pay, you can explore the island, count the steps down to the docks (or up if you rented your own boat). The story goes that getting married at the church on this island requires the groom to carry his bride up each of the ninety-nine steps to the top. Only after he does this is he able to marry the woman of his dream. Got to love a little romance! There is also a café on the island, but it is pretty expensive. We actually weren’t able to visit the Lake Bled Castle on our first visit because we had so many other things to see. But we didn’t make that same mistake when we drove from Germany to Croatia and stayed near Lake Bled as a ½ way mark. Want to read more about our trip to Croatia? 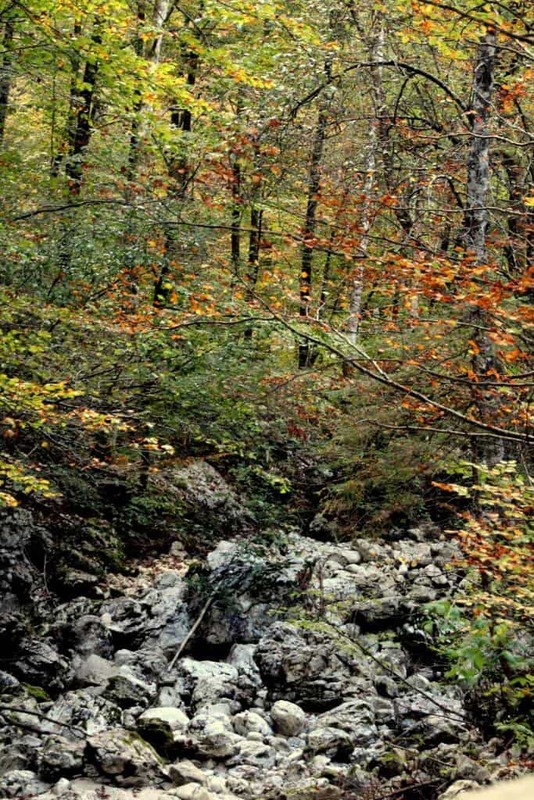 Head over to our blog post, “Enjoying Croatian Family Holidays”. The Castle offers incredible views overlooking Lake Bled, it’s island and church with surrounding town. Be sure to visit on a nice clear day for the best views. But not to fear, even on a cloudy or rainy day, you can still clamber around the old walls, learn about how wine was made and even create and label your own bottle (for a fee). Or perhaps the kids are interested in learning how books and pamphlets were printed in the medieval era? Great for making your own little gifts for families when you return from your travels. If you are romantics at heart, be sure to make dinner reservations and have a glass of wine in an 11th-century castle, it doesn’t get much more romantic than that! 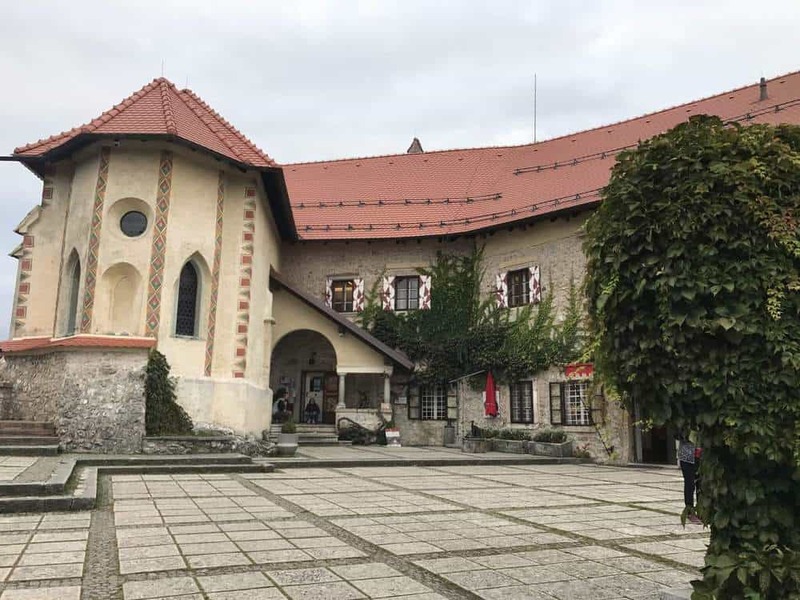 The castle is a pretty good deal at 7 euro per person, but be warned about extras for winemaking, gifts direct from the printing press and café costs. Need a bit of adventure? 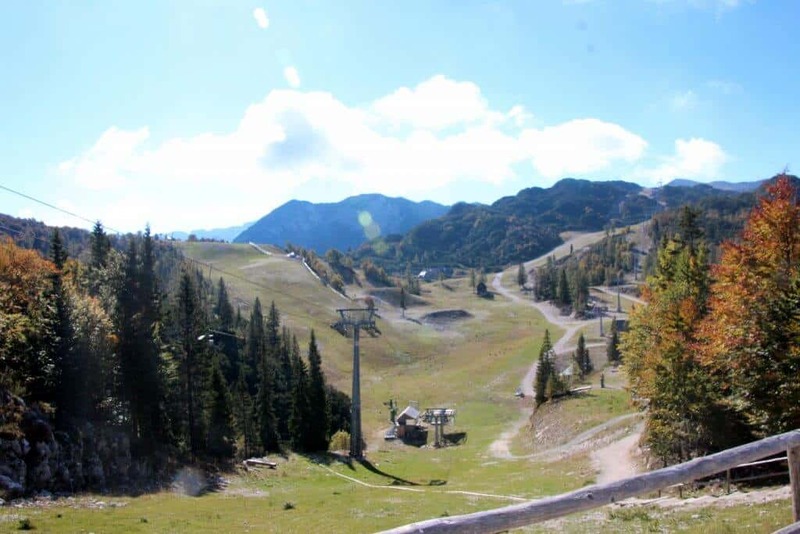 If you are visiting in the summer or late Spring/Early Fall, then check out the fun activity of rodelbahn. It’s a summer version of snow tobogganing, or perhaps we should say it’s like a little personal roller coaster down the hill (you control the brake). Either way, it’s a blast and a highlight of our son’s time in Europe. They are usually open on the weekends from 11:00-4: 30 pm, but always check the website before going. They also don’t operate in the rain. But at 6 euro per ride plus 3 euro for the chairlift up, it’s so much fun! Lake Bohinj is about a 30-minute drive from Lake Bled and is located 16 miles southwest. When you first arrive, you’ll see the little town with shops, restaurants, and cafes. You will also find access to the water. 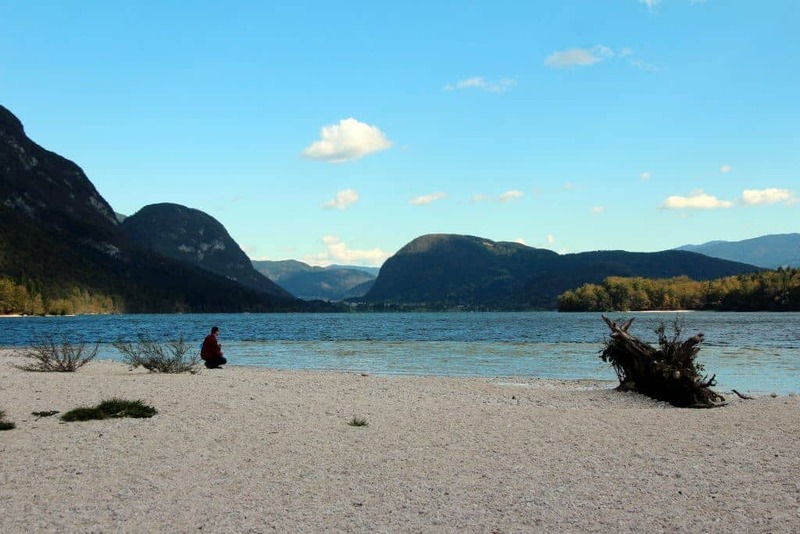 There is a nice trail that goes all the way around Lake Bohinj, but our favorite spot was located at the back of the lake (opposite the town). We parked by a woodland playground and then found a trail that led us through the forest until we reached a sandy and pebbly beach with a sandbar that jutted out into the lake. It was perfect for our son to play safety near the water and there were plenty of fun rocks and logs to scamper around. If you plan to visit Lake Bohinj, make it a day trip and pair it with a ride up the Vogel Cable car. 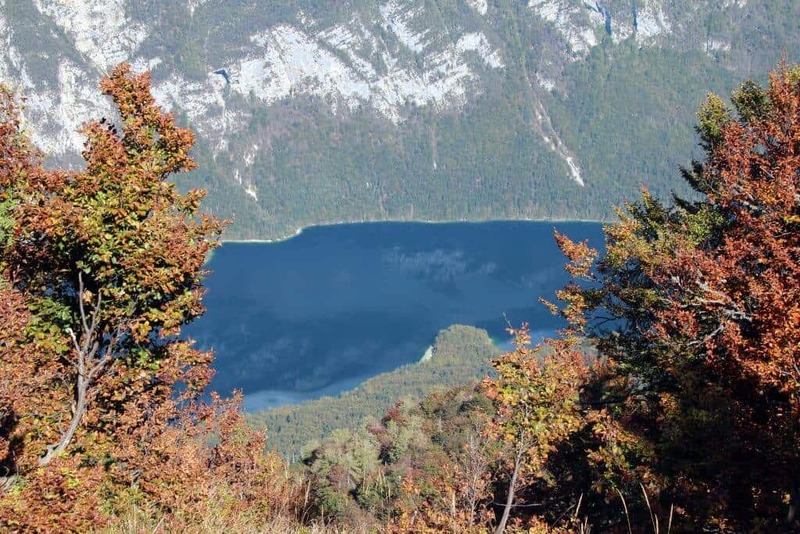 It is open from 8am-6pm on most days, so we actually took a ride up the cable car first and then explored Lake Bohinj afterward. During our trip, a ride cost about 14 euros per person (round trip). Our son, like most little boys, found the ride up quite exhilarating. We also brought our dog along for the adventure. All of Europe is amazingly dog-friendly and Slovenia is certainly no exception. Once at the top, we wandered around exploring a few trails and finding some local sheep grazing on the fresh green grass. We discovered little huts that are available for rent and dreamed about renting one during the ski season (always a reason to return). We ended our visit on the mountain with a nice hearty lunch at the restaurant overlooking the cliff. The food was plenty and very good. There is also a Wild Board hut with snacks if you’d prefer lighter fare. 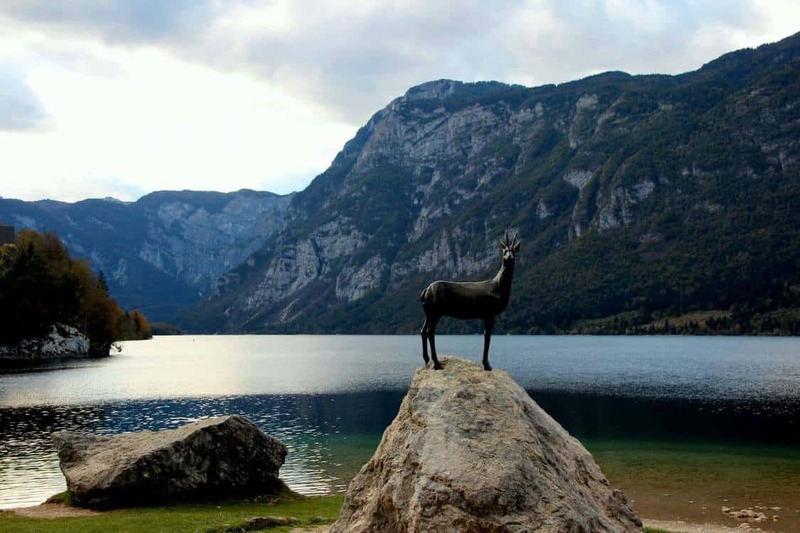 Looking for more to do near Lake Bohinj? Located just down the road from the Vogel Cable Car lift, you’ll follow the road along the lake to where it ends at the trailhead for the waterfall. 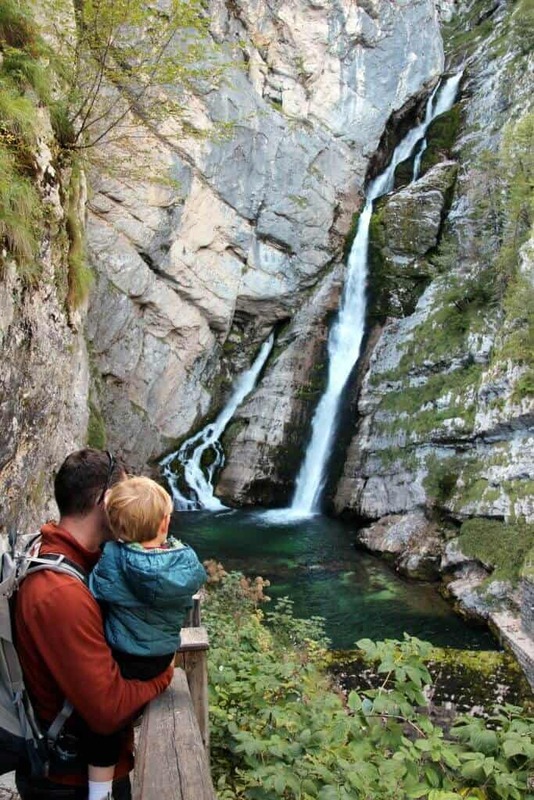 Be warned that parking isn’t free and there are a lot of stairs to climb, but if you are a waterfall lover, then hit the trail! But we’ve seen our fair share of waterfalls (Hawaii, Switzerland, South Africa) and this one was just eh for all the effort. If you go with kids, you’ll need a baby carrier (either soft-sided or hiking) because there is no way around the stairs. Once you reach the waterfall area, it is gated off, so tough to really enjoy the views. We honestly preferred our next recommendation…. 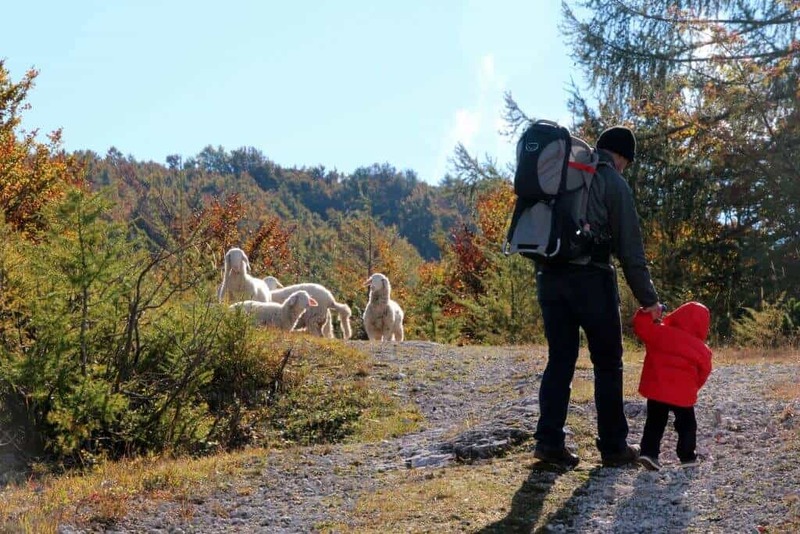 Located just 2.5 miles north of Lake Bled and hikeable from the town (or drive and park), this is a fabulous activity for active families. Vintgar Gorge is a combination of waterfalls, a rushing river and rock walls that you wind through on walkways and cliffs. It is open from 8am-7pm and best if you get there early to beat the crowds and get to enjoy the views instead of seeing tourists in every vantage point. Make sure to wear good shoes and a rain jacket because rushing water and waterfalls equals wet conditions. I’d also recommend a carrier for the little ones that can’t make the entire walk. With low overhangs, I’d pick a soft structured carrier over a hiking carrier. At 4 euro’s per person, it’s an inexpensive activity that will delight just about everyone (including the dog)! Time to stretch our legs and get out a bit further. 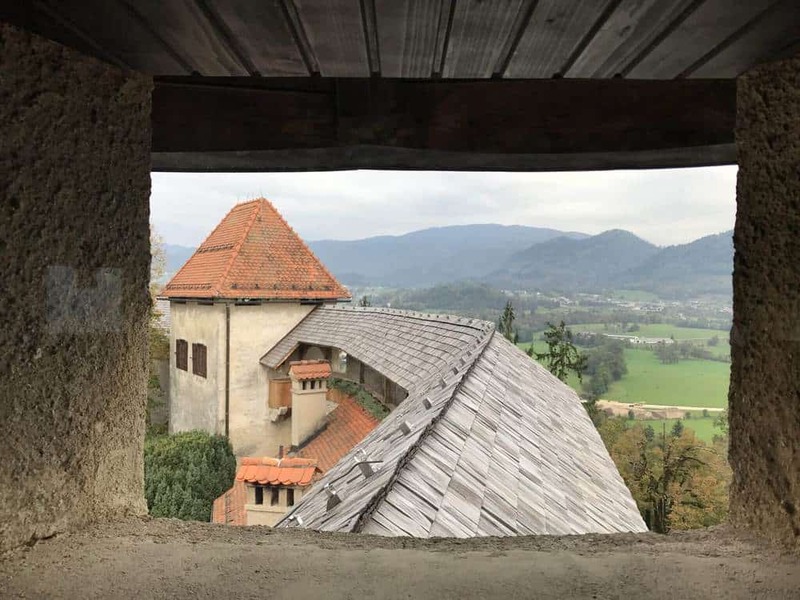 Slovenia isn’t a huge country and Lake Bled is pretty central, so when I planned the trip, I decided to make that our home base and avoid multiple hotel moves. 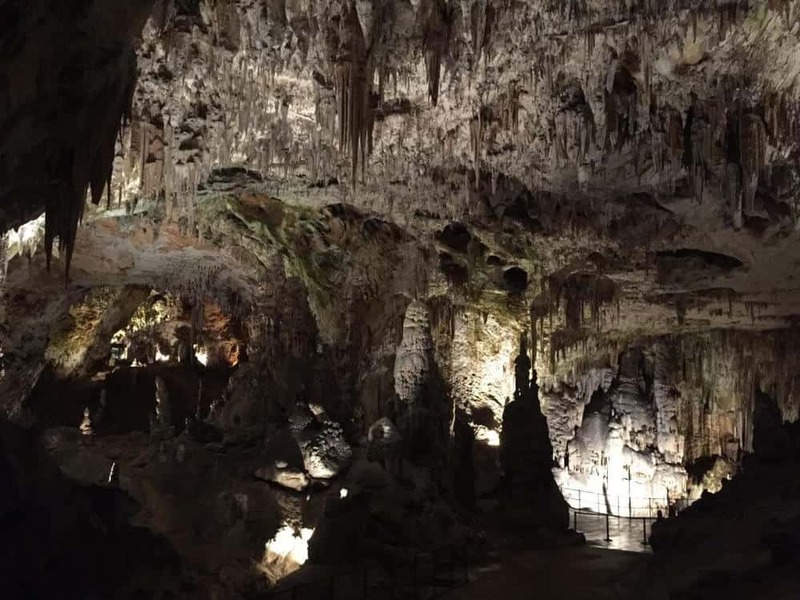 So one day, we hit the road and headed out to explore the Postojna caves. You’ll want to check the website before you go and make sure you plan to arrive during a tour with the appropriate language. For English, they are six tour options (10am, 11am, 12pm…..2pm, 3pm, 4pm). The cave tour does last 1 hour and 30 minutes, so consider it if you have small children. When you arrive, you’ll purchase tickets for the tour of your choice and then be directed to a waiting area. When your tour is called, you will walk into the cave and board a cute little train. This will take you deeper into the cave. When you get off, you’ll gather with your tour to begin. We stuck with the tour for about 10 minutes and then decided to break off from the group on our own. We found a bit of a pocket between tour groups and enjoyed our visit. Although we didn’t learn as much about the caves, we were able to easily catch the train back out of the caves and we were able to go at our own pace. If you plan to visit the caves and our next recommendation, Predjama castle, buy a combination ticket for around 31.90 euro per person (less for small children). 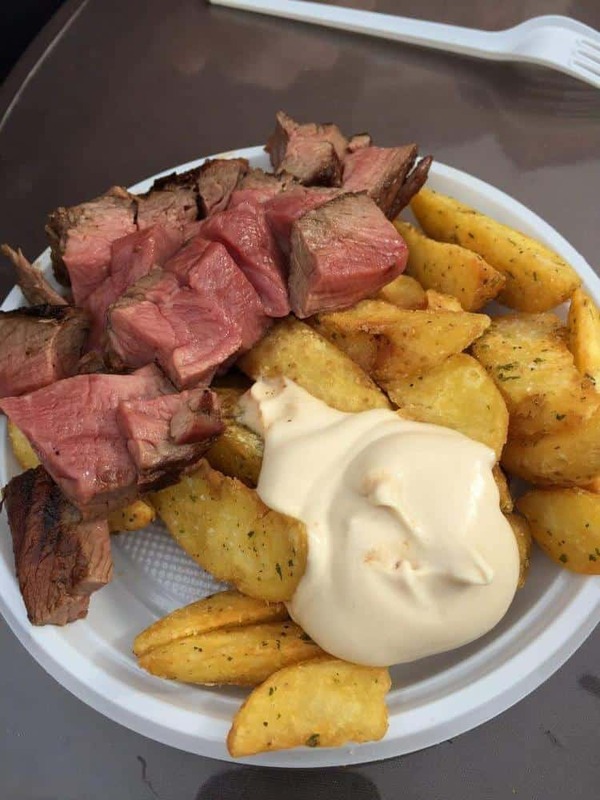 We did eat at the café located by the caves and thought the food was good and priced well. There aren’t too many options located near the cave, so it’s something to consider. 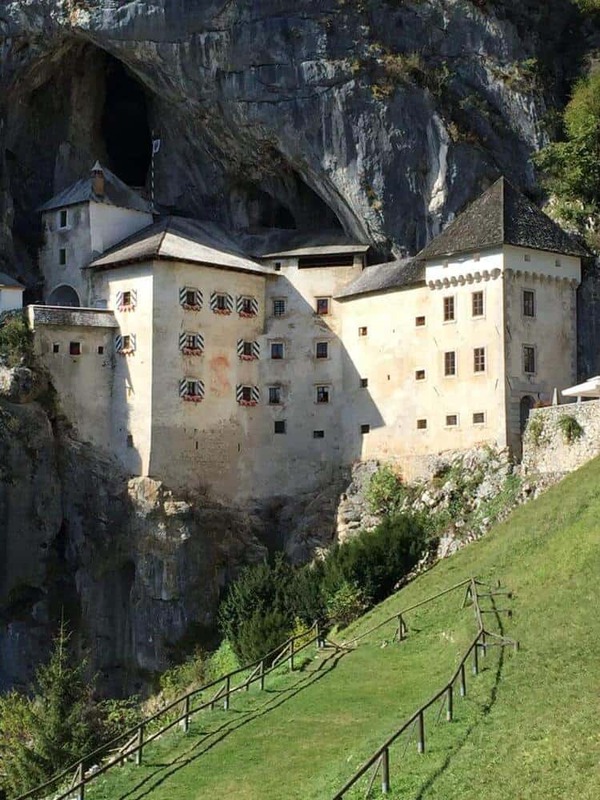 If you are making a day trip, then consider visiting Predjama castle after your visit to Postojna caves. It is located a short 15-minute drive from the caves and they run a shuttle between the two during the busy months. Predjama castle is one of our favorite castles to visit. It was so unique in its style, its furnishings and the story behind the owner (and what happened to him). I won’t spoil all the fun, but I will recommend paying for the audio guide and leaving plenty of time to explore all the nooks and crannies of the castle. Be sure to read the history of the owner and a yearlong siege against him. Everyone loves a good story of Robin Hood right? Our list ends with the capital of Slovenia, Ljubljana. 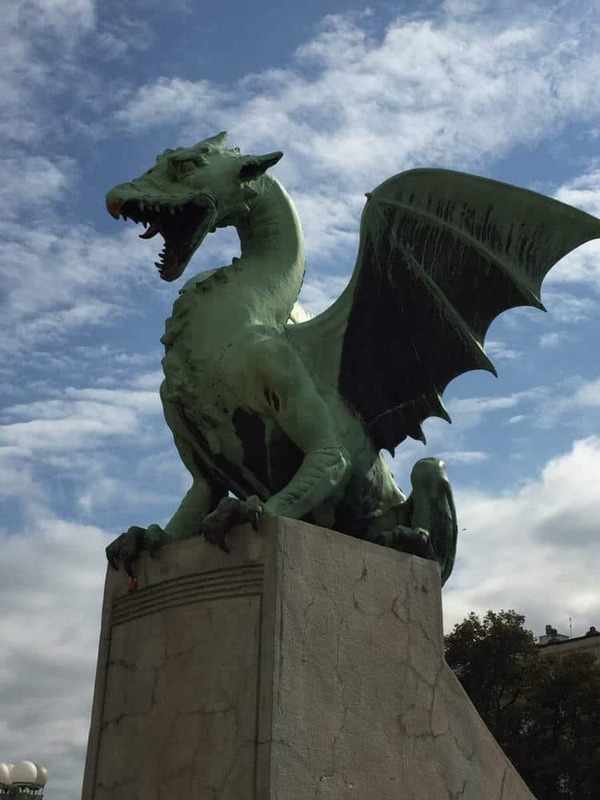 No visit to Slovenia would be complete without visiting Ljubljana. A trip Ljubljana from Lake Bled takes less than 45 minutes and it is a wonderful city to explore. 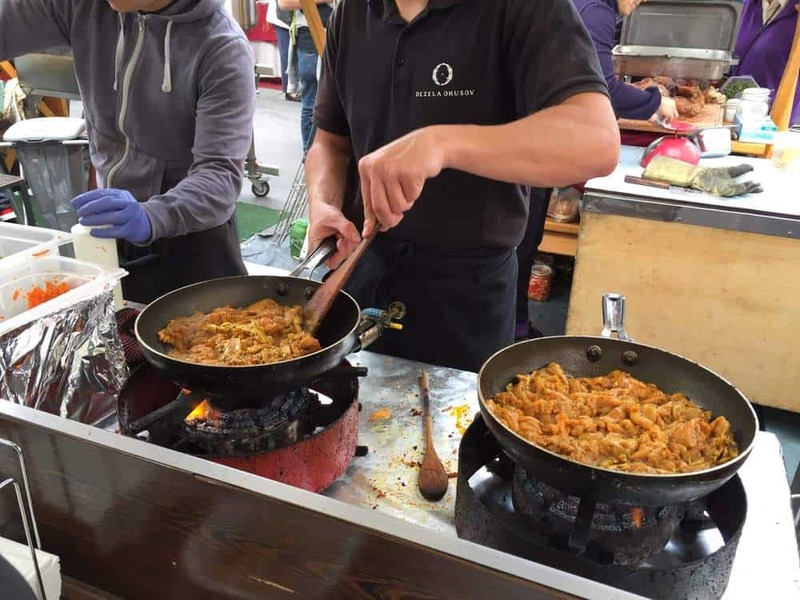 If you can plan your trip on a Friday afternoon, take advantage of the delicious food truck meet up that takes place in the area called the “Open Kitchen”. Use this address: Pogačarjev trg, 1000 Ljubljana, Slovenia. Now I’ll tempt you with all the amazing food we tried. Just down from the Open Kitchen is the bridge with the lions, plenty of fun shopping options and beautiful churches to duck inside. If you are traveling with kids, like us, head over to City Park (Park Tivoli) for amazing green spaces and playgrounds to explore. 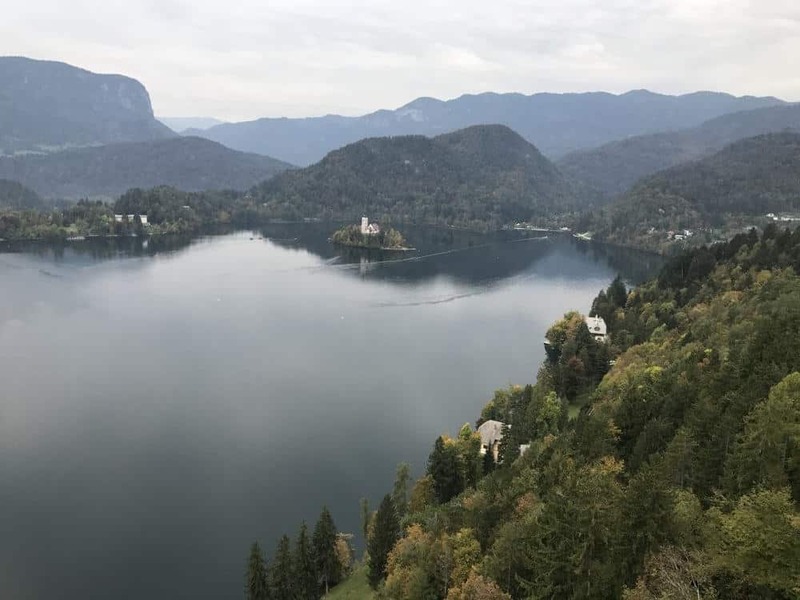 We hope this list of our top 10 things to do in Lake Bled Slovenia helps to inspire you to visit this amazing country! There is something special about visiting a place that isn’t inundated with visitors and has a wide variety of things to see and do. Feel free to ask any questions by contacting me, leaving a comment or finding me on Facebook or Instagram. 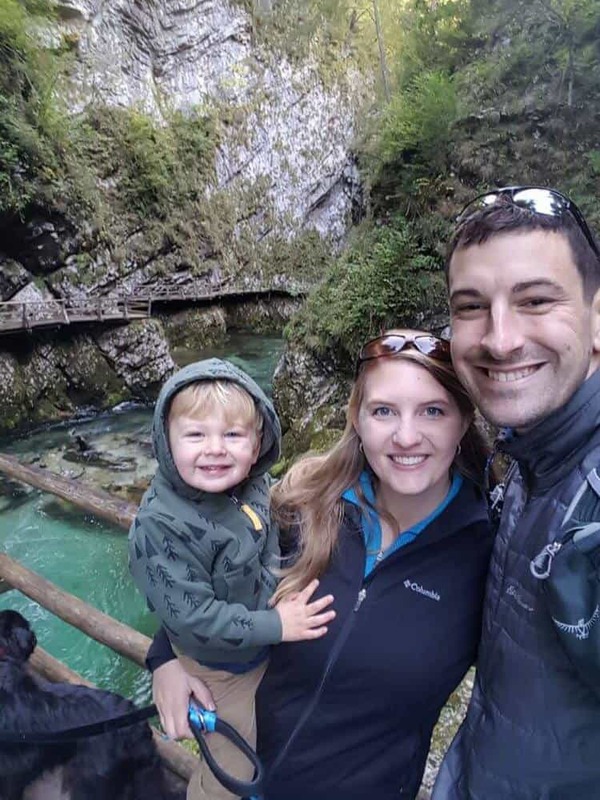 I created this travel blog to help other families to explore the world with their kids and I hope I’ve inspired you. Want to read more? Head over to my destinations page and explore my interactive map, it’s pretty fun. Until next time!